At some point in time, most of us have included exfoliation as a part of our skin care routines. If you’re looking for a more effective exfoliation treatment that also takes care of pesky “peach fuzz,” dermaplaning may be just the thing for you. When it comes to effective exfoliation, dermaplaning is a quick, effective, and noninvasive treatment. Dermaplaning encourages cellular turnover and provides immediate results because the controlled injury to your skin encourages your body’s natural healing and reparative response. During this treatment, your provider will manually remove the dead skin cells on the surface of your skin. Dermaplaning also removes the peach fuzz on your skin that is responsible for holding on to extra oil and dirt that can lead to skin problems. Don’t worry! The hair won’t grow back thicker or darker! To optimize your results, Aesthetic & Dermatology Center provides custom facials with every dermaplaning treatment. Your provider will discuss your cosmetic goals and determine the best facial for your needs. Dermaplaning is a painless procedure. Your highly-trained aesthetician will gently remove the top layer of skin. Treatment generally takes about 30 minutes, or 1 hour with a full facial, and you will see immediate results. You will be able to see the results of dermaplaning immediately after treatment. After the oil and dirt has been removed from your skin, facial products and treatments will be more effective. Your skin will be particularly sensitive to sunlight after the procedure, so your aesthetician will apply sunscreen to your skin after your treatment. Unless you are currently experiencing an acne breakout, dermaplaning is a good option for you. 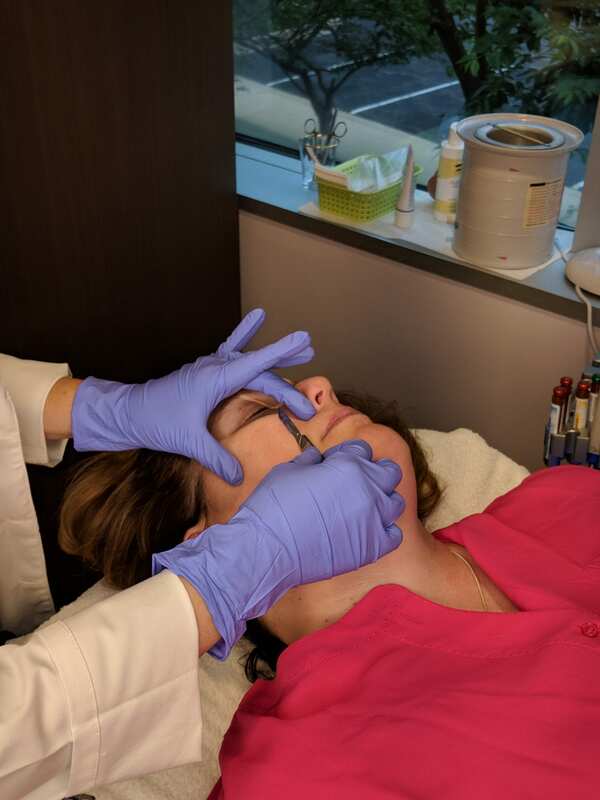 Dermaplaning is particularly good for pregnant women or people with specific skin irritation to chemicals commonly found in traditional exfoliation products because dermaplaning does not expose the skin to these chemicals. Where microdermabrasion sands and suctions off dead skin cells to remove dead skin and clean pores, dermaplaning scrapes off the top layer of skin while removing peach fuzz. Objectively, neither procedure is better than the other. In fact, the two treatments may even be combined. During a consultation, your aesthetician at Aesthetic & Dermatology Center will discuss your cosmetic goals and help determine which treatment is best for you and your skin type. If you want to know more about how dermaplaning can help you achieve the healthy-looking skin you’ve been wanting, call our office at (301) 610-0663 to make an appointment with our expert aesthetician. To find out whether dermaplaning is right for you, call our office today at (301) 610-0663 or request an appointment online.